First and foremost, apart from cabinets what do you think of plate racks? Your mind might be going to some country design, but you can always opt for a more modern design. They should be used so as to have easy access to everyday dishes. However, they are not meant for special dishes as they will just get dusty, instead of pulling out stacked utensils from the wall cabinet, you can easily store them vertically within distinctive slots allowing you to grab them at the same time putting them away without chipping. Below are ways to make them work in your kitchen:Unfitted and over the sink: Generally, this is a typical location for a plate rack; it is more open than a cabinet with solid doors, but also the perfect spot for emptying plates away from the dishwasher. It may give the illusion of being unfitted or floating in the center of the wall and it looks inherited or found rather than designed together with the cabinets. Unfitted on its own: If you have a small and quirky space and don’t really have the option of using a symmetrical wall cabinets design on both sides of your space, an unfitted dish rack cabinet is the way to go so as to get the storage problem sorted out without having to force the balance issue. This solution allows you to kill two birds with one stone, and at the same time baking a cake and having to eat it too. Integrated with other wall cabinets: If you are thinking about incorporating a plate rack into other regular wall cabinets, think about making them glass so that the whole wall has a sense of openness and depth. Don’t be shy about showing off your dishes, glassware and other kitchen stuff, it doesn’t have to match. Keep in mind that incorporating an open shelf together with a dish rack is a suitable way to soften the kitchen and prevent it from looking utilitarian. Also, most modern kitchens are able to incorporate a dish rack cabinet by flanking it between aluminum and glass cabinets. Generally, this may be achieved by using a plate-rack cabinet because it makes the space feel more unfitted and collected. If flanked by two windows the plate rack creates a visual center; hence, a sense of balance even if the base cabinets aren’t symmetrical. Keep in mind that the contrasting color may be placed asymmetrical in the kitchen, but in the real sense it is symmetrical on its own. Focus on the counter: Plate rack integrated into open shelves can work as an Uber-functional storage wall where your cabinets can sit on the countertop. It is a mixed use storage wall that uses a small section of the countertop for prepping or tasking. The amount of door sizes ranging from open to closed storage create a much more visual interest that cabinet doors which are all the same size. You do not need to limit yourself on using a plate rack alone; however, you can get more out of the cabinets by installing an appliance storage system below the open shelves. 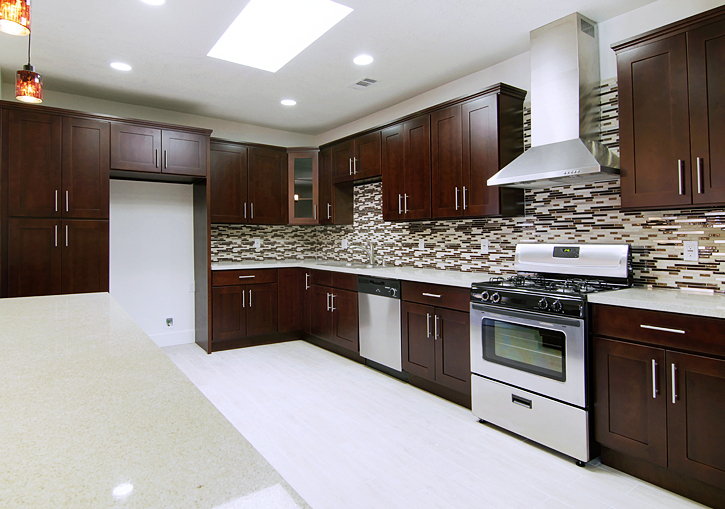 For more information and cabinet tips, do not hesitate to contact Premium Cabinets of Santa Ana. ARE YOU READY FOR A DARK AND SPECTACULAR KITCHEN?